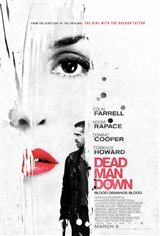 you know, it's a bit of a cliché, man seeks revenge for the death of his wife and daughter at the hand of mobsters but this was a really good movie. Love it,so don't believed with the bad reviews. Although I like Farrell and Rapace, this movie is for the birds. Far too many plot holes and also a ridiculous premise. I cannot believe people have rated this so high. Like another reviewer said (somewhere): we need to raise the bar as to what is considered good. I thought this would be the usual shoot-em-up movie, but was very surprised that it had a very good, suspense filled, story at it's heart.As a result, it is a movie not just for "the guys"
570 News gave this a good review so I decided to check it out. Nice mix of action, mystery and revenge. Noomi Rapace once again takes a roll and portrays it with her own style of colorful and emotive acting. Good chemistry with Farrell.